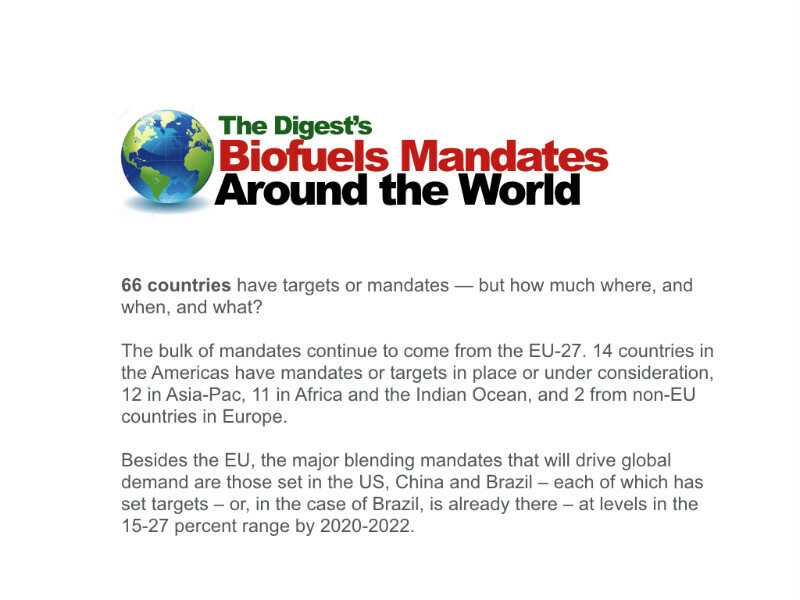 In Florida, the Digest today releases its annual review of biofuels mandates and targets around the world, looking at the state of biofuels mandates in 65 countries. The bulk of mandates continue to come from the EU-27, where the Renewable Energy Directive (RED) once specified a 10 percent renewable content by 2020 but has been scaled back to the 5-7.5 percent range — and has seen proposals for first-gen fuel mandates fall below 4% in an effort to shift more aggressively towards advanced biofuels. 14 countries in the Americas have mandates or targets in place or under consideration, 12 in Asia-Pac, 11 in Africa and the Indian Ocean, and 2 from non-EU countries in Europe. Besides the EU, the major blending mandates that will drive global demand are those set in the US, China and Brazil – each of which has set targets – or, in the case of Brazil, is already there – at levels in the 15-27 percent range by 2020-2022. Visual guides to the LCFS and the RFS. Are Mandates a thing of the past? Lux Research thinks so. A report out from Lux in December 2016 concluded that “a new generation of policies is based on technology-agnostic carbon intensity metrics, led by the California Air Resources Board (CARB) Low-Carbon Fuel Standard (LCFS). Renewable diesel and conventional electricity will be the near-term winners according to the Identifying Winners in Low-Carbon Fuels report,” said lead author Yuan-Sheng Yu. The next big winner? Renewable electricity, he said. Hmm, not so fast. We’re seeing countries shifting in terms of obligated volumes — banded on sustainability, domestic production, cost and availability of advanced technology. Europe’s been wobbling down, the Americas and Asia have been wobbling up. It’s mostly a war of words. Whether a distinct low-carbon market is established based on volumetric or carbon-content standards, they are mandated alternative markets, aimed to resolve the “externality” problem in which reduced carbon benefits society, rather than investors without establishing a direct carbon tax. California has been the model for low carbon standards. Currently, California uses seven different low-carbon fuels derived from 26 different feedstocks, making up 11.3% of its fuel consumption. Under the state’s new regulations, growth of petroleum consumption has slowed to a mere 0.5% quarterly, while low-carbon fuels grew at 1.6% quarterly. But along comes Canada now with its proposed Clean Fuels Standard —± and that’s the biggest news on the biofuels mandate front.